Chris - Today, we're looking at the science of food. One very important issue about food is safety. There are millions of people every year ending up locked to loo seats for longer than they'd like - try saying that when you've had a few - just because of something that they ate. But what are the risks and how can we reduce them? And are 'best before' dates actually helpful? To help us look into this is Dr. Nick Brown. He's a Consultant Medical Microbiologist at Addenbrookes Hospital. So tell us first of all, when food goes off, what actually is happening? Nick - This is a natural process. If we start by looking at things that haven't got 'best before' dates, for example things not from the supermarket like fruits, vegetables and so on, we know that if we keep them for a long period of time, they start to deteriorate. They either go squidgy, or they change colour, or sometimes they smell horrible. Certainly, the texture and taste can be affected as well. We've heard already about natural bacteria in cheeses. Well, a lot of other foods have natural bacteria too and this is a process that is occurring all the time - the process of decay or food spoilage. Chris - So I think it's an important distinction between food that's spoiled and breaks down and just turns mushy but isn't necessarily bad for you, and food that has got things that could make you quite unwell. Nick - Absolutely. The classical things that can harm you of course are meat products. Often, these are contaminated with food poisoning organisms such as Campylobacter or Salmonella. If you do not cook these foods properly then you can be affected by the illnesses that these organisms cause. Chris - But where did that food get those particular organisms in the first place? Nick - Well they can get them from a variety of places. We know that many foods contain organisms already. We've heard about cheese, from milk for example, and from the environment. Often meat products are contaminated with organisms that are acquired from the organisms, the animals themselves. So the animal has the organism for example in its gut, and then when we prepare the meat, the meat is contaminated. Another way of course they can get contaminated is by virtue of the processing itself. So if you have a product, for example a cold meat, a prepared meat that you're going to eat. If it's stored in an inappropriate way, next to raw meat, then it can be contaminated by cross contamination. Chris - I did read somewhere that when chickens are prepared for example, although only a small fraction of chickens may carry Salmonella naturally in their gut at a reasonable level, because of the way they're prepared, many of the carcasses are put through a vat of ice cold water to rapidly chill them down after they've been plucked. And so, if one of them has some Salmonella in it and on it, it then contaminates the water which means that pretty much all of them come out with at least some Salmonella. Nick - That would be an example of the way in which a process can contaminate a wide range of different products, yes. Chris - Now what about actually when you've cooked some meat? So we cook the said chicken. I can eat it cold after I've cooked it and let it cool, but what about reheating it, because there seems to be a lot of confusion around that. People often say, "Well it's cooked. You shouldn't reheat it or if you do reheat it, you've got to reheat it properly." What's the actual bottom line on this? Nick - Well of course when you cook food, most of the microorganisms that cause food poisoning are very sensitive to heat, so the numbers are reduced very rapidly. But on storage, even if there are one or two left behind, then they can replicate very quickly and so, over time the product can almost become recontaminated if you like. So that is a danger if you don't heat it properly thoroughly before eating it. Chris - In other words, you would heat it but insufficiently to destroy the organisms, but sufficiently to warm them up so they grow faster. They then turn a non-infectious dose into an infectious dose, and you then catch whatever they've got to give away. Nick - Absolutely, yes. And some organisms have a different mechanism. They can produce toxins that can cause food poisoning as well. Chris - How would that work then? Nick - For example, Staphylococcus aureus, an organism that's on many of our skins, can contaminate dairy products. If this then is given the opportunity to replicate, it can produce a variety of different toxins that can act on the gut, and usually causes upper gut problems, particularly nausea and vomiting rather than diarrhoea itself. Chris - And when you reheat the food, does it matter how hot you make it? The bacteria break down but the toxin doesn't necessarily? Nick - Absolutely. Some of these toxins are heat stable so they're not broken down again. Chris - And what about the dreaded 'best before' date then? Is this is a safe guard? How do supermarkets and vendors work out, "Well, we're going to put this particular date on an item of food" and that means it's safe and then it goes past midnight, and it's the day after the 'best before' date, now it's not? Nick - There's actually quite a lot of confusion about this and partly that's because there are a lot of different ways that food can be labelled. Food can have 'sell by' dates, 'display until' dates, and these are largely for the use of the shop itself, and relate to quality of food. Then you've got 'best before' dates, and importantly, 'use before' dates and I think that these two are different. 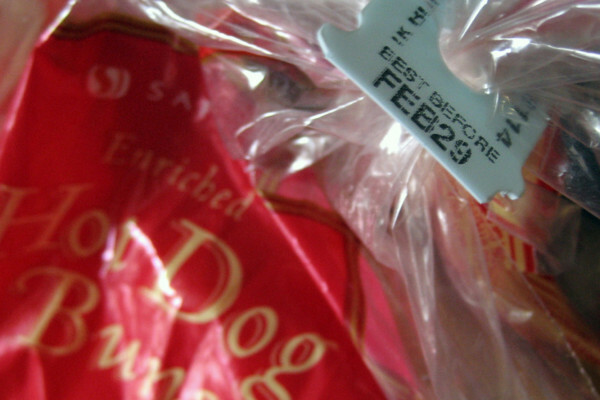 'Best before' dates as it suggests, implies that the food will start to deteriorate and won't be as good after the 'best before' date, but is not actually dangerous. Whereas the 'use before' date really does say that you should be consuming the product before the end of that and often, there is evidence to show that it does deteriorate and become - not always dangerous, but it has the potential to be dangerous if you eat it afterwards. Chris - So the bottom line is, let's use the 'use by' date, but we could disregard the 'best before' and still probably get away with it okay. Nick - Still get away with it, but it might not be as good as it was before.